An essential part of any serious Bug Out Bag (BOB), Get Home Bag (GHB), survival pack, or outdoorsman’s rucksack is a magnetic compass. Not a smartphone compass app, but a real, no battery needed compass. A magnetic compass will always work because of Earth’s magnetic field. 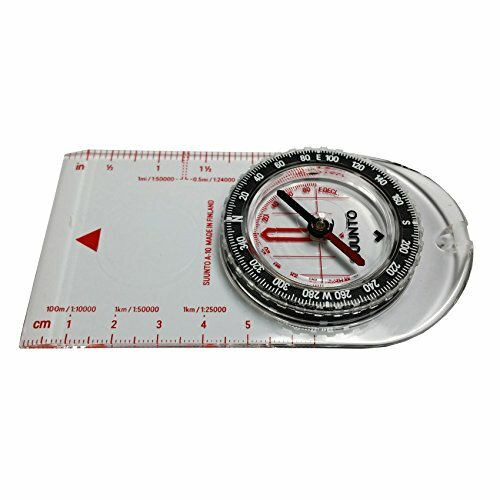 Baseplate compasses work well with maps, but certainly can be used without a map as well. We’re going to review the best options for baseplate compasses, because that’s the type we’d recommend. We’re going to present a variety of compass options. 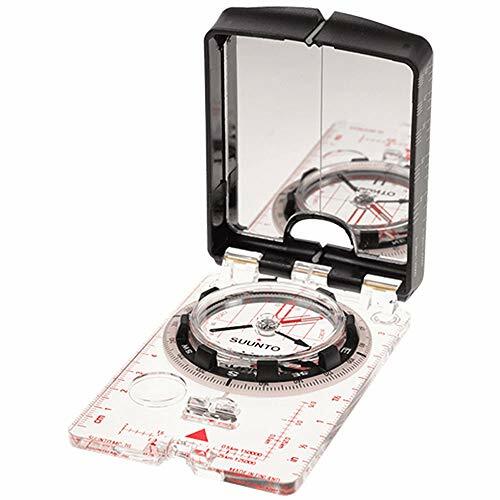 To understand the benefit of some of these compass features, it would be good to quickly review some of the key terms involved with magnetic compasses and land navigation. Much of this information is derived from the US Army’s field manual for Map Reading and Land Navigation. For those without military experience, it should be known that the military has driven the need for accurate and complete maps since the beginning of human history. We’ll start with map terminology. A map is a graphic representation of a portion of the earth’s surface drawn to scale, as seen from above. Maps intended for navigation have a rectangular grid superimposed on top for ease of use. These so called grid squares can be defined in a variety of ways. The US military has standardized on the Universal Transverse Mercator (UTM) grid for many, many years. UTM is gaining popularity in the GPS device world as well, because it is easier to comprehend than Latitude and Longitude. For the polar regions of the Earth (South pole, North pole) an alternative grid format is used – the Universal Polar Stereographic (UPS) grid. Polar navigation is probably the exception for most of our readers, so we won’t focus on it further. The grid squares are of fixed size, representing some distance. If you know the grid size, you can tell how far (or close) another location is on the map. Map Scale is the ratio or fraction between the distance on a map and the corresponding distance on the surface of the earth. Maps with scale 1:50,000 are preferred for most land navigation. For example, the scale note 1:50,000 indicates that one unit of measure on the map equals 50,000 units of the same measure on the ground. This method of representing the scale is known as the Representative Fraction (RF). 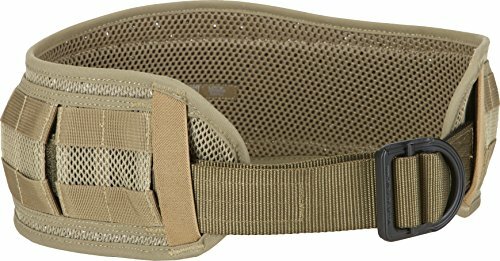 A topographic map is typically used for land navigation. Unlike the road map you may be familiar with, this type of map uses contour lines to represent terrain features such as hills, ridges, valleys, and other changes in elevation. These are important considerations when you are going off the established roads and traveling by foot. Further, these maps use colors to designate features – blue for water (lakes, swamps, rivers, etc. ), green for vegetation and forests, etc. Direction is an important concept in land navigation. Directions are expressed as units of angular measure. Degrees are most common unit of measure for direction. There are 360 degrees (º) with subdivisions of minutes (‘) and seconds (“). 1 degree = 60 minutes, and 1 minute = 60 seconds. Another popular unit of direction in the military is the mil. The mil expresses the size of an angle formed when a circle is divided into 6,400 equally sized angles. Both degrees and mils represent the same concept. A circle equals 6400 mils divided by 360 degrees, or 17.78 mils per degree. To convert degrees to mils, multiply degrees by 17.78. Some foreign maps may use grads as their unit of direction. There are 400 grads in a full circle. To use direction, we must have an agreed to starting point, or base line. Everyone is familiar with the concept of North. But there are in fact three strict interpretations of where north is. the north pole. On a map or compass it is usually represented via a star. By the way, the North Star – which is visible at night from just about anywhere in the northern hemisphere is less than 1 degree off true north and does not move from its place because the axis of the earth is pointed toward it. Hence the name. Magnetic north is the direction to the north magnetic pole, as indicated by the north-seeking needle of a magnetic instrument. The magnetic north is usually symbolized by a line ending with half of an arrowhead. on the map. Usually designated as GN on the map. Magnetic north is what we’ll use most with a magnetic compass. An azimuth is a horizontal angle, measured in a clockwise manner from a north base line, expressing direction. Back azimuth is the opposite direction of an azimuth. Think of the “about face” – a turn to face the opposite direction. Because it is the opposite direction of an azimuth, you can obtain a back azimuth from an azimuth by simply adding 180 degrees if the azimuth is 180 degrees or less; or subtracting 180 degrees if the azimuth is 180 degrees or more. Azimuth is also commonly called a bearing. To determine the direction of travel to reach another point on the map, we’d figure out the grid azimuth between the starting point and ending point. To obtain a grid azimuth a protractor is used. This clear plastic measuring device is meant to be laid over the map such that you can quickly and easily generate a grid azimuth as needed. compass, the declination of most interest to you will be between magnetic and grid north. The first step to using a map correctly is orienting the map. Maps for navigation will typically include a declination diagram which indicates the angular relationships of true north, grid north, and magnetic north. This is necessary because your magnetic compass has utterly no way to know “grid north”. Based on the earth’s magnetism it can only directly measure magnetic north. The magnetic compass measures magnetic azimuths. You use declination adjustments to ensure you can correctly orient your direction to the maps. Resection is the method of locating one’s position on a map by determining the grid azimuth to at least two well-defined locations that can be pinpointed on the map. This might be things such as tall man made structures that can be located both visually and appear on the map. But a distinct geographical feature such as a hilltop might be used as well. And lastly, an important part of land navigation with a map and compass is keeping an accurate pace count. The compass will tell you what direction to head, but most times you’ve got to measure distance on your own. Adjustable declination correction – REI guide on how to set declination. 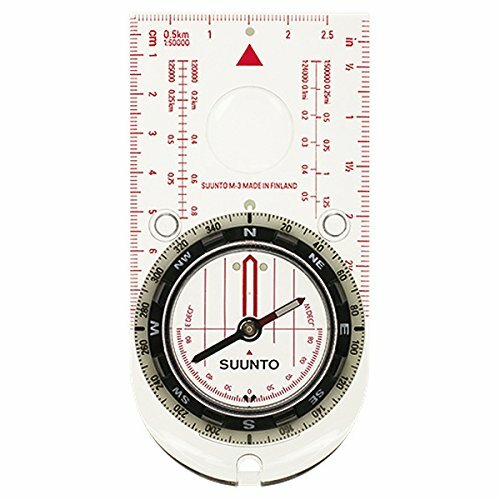 The Suunto A-10 (Buy on Amazon) is Suunto’s entry level hiking and orienteering compass. It is fast, simple and accurate. 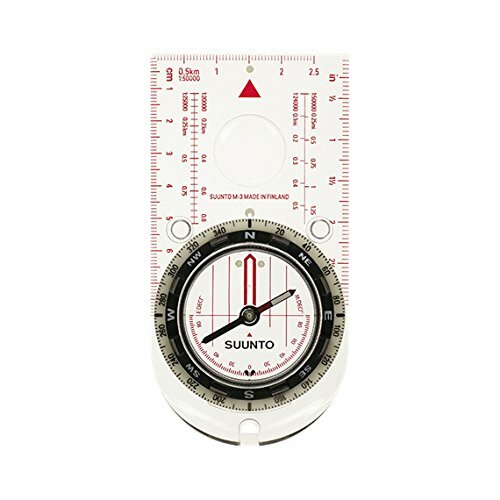 Baseplate compasses are quick to learn and ideal for navigating with a map and compass. This model is marked with Imperial scales (inches and miles). It includes a lanyard as well. 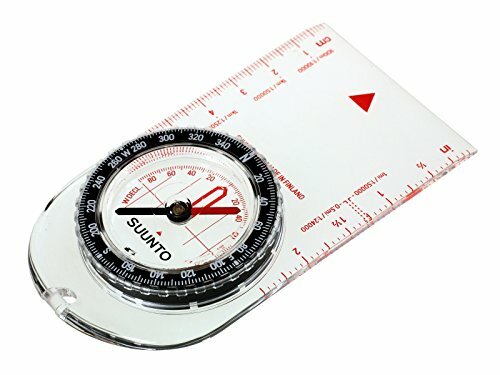 This is the best cheap, but accurate compass option from Suunto. Step up to the and you also get luminescent markings so it’s easier to operate in low light, and a magnifying lens on the transparent baseplate. This makes it easier to use with a map – especially for those with aged eyes. But to be honest in any low-light condition magnification makes it much easier to see small map details. The magnifier and can double as a fire starting implement in extreme circumstances. 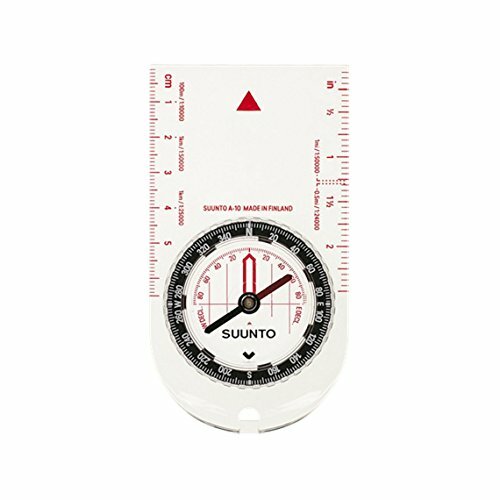 The Suunto A-30 is marked with metric scales – centimeters and kilometers. And the “NH” in the name? It’s balanced for the Northern Hemisphere. So don’t get this if you need a global compass balanced for both the northern and southern hemispheres. Includes a detachable lanyard, and has the Suunto limited lifetime warranty. This is considered a premium compass, because it’s got some real important features. The M-3 G Compass (Buy on Amazon) is globally balanced – that’s what the G stands for in the name. It’s got the baseplate with magnifying lens. Not only that, it also has the low-light luminescent markings. What’s more – it is marked up in both metric and imperial UTM scales. If you never know what sort of map you are going to end up working with, this is your best option. This model also has adjustable declination. And lastly, this compass includes a liquid filled clinometer with 2 degrees accuracy. A clinometer is used for measuring angles of slope (or tilt) and elevation. Why do you need that on a compass? It can be used to estimate a slope’s angle of inclination from which changes in elevation may be calculated – this is often important when navigating backcountry. 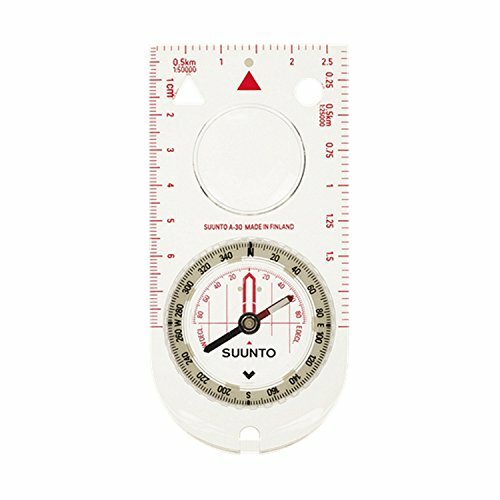 The Suunto MC-2 Compass (Buy on Amazon) is our premium baseplate compass pick. But perhaps most importantly – it’s a mirror compass. This model also has just about every other feature you would want on a compass. We recommend every serious survival pack or go bag have a good, old fashioned magnetic compass. 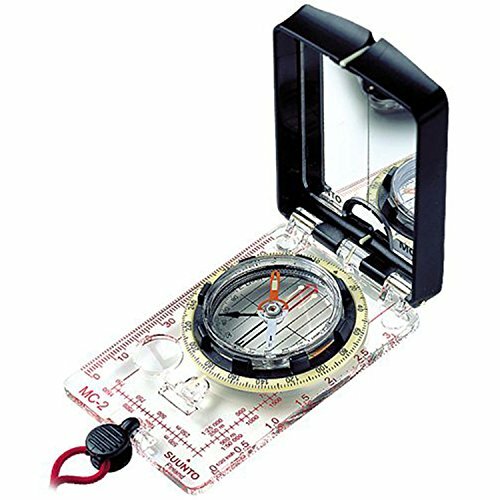 We recommend baseplate (or orienteering) compasses because they can be used with a map, or without. Some models have additional features, such as a mirrors, that can double as important survival items. 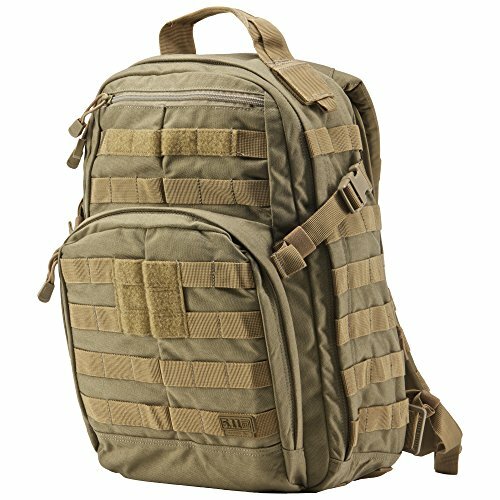 Need a ruck sack? These bargain rucksacks work just as well as the expensive ones - find out how.